SIGNAL HILL, Calif. /California Newswire/ — There are smiles on the faces of more children and families this summer – smiles very familiar to one local food bank. For the third year in a row, Food Finders of Signal Hill is hosting its "Summer To End Hunger" food drive 2013. This drive aims to fill in the hunger gaps where school breakfast and lunch programs end. The Summer To End Hunger food drive kicked off in May, with local businesses joining the campaign to feed children in need. As food comes in and gets sorted, complete boxes are being distributed to Food Finders' partner agencies and shelters, providing families with up to a month's worth of food. So far, the drive has helped families and children at agencies such as Centro Shalom, New Generations and Clear Foundation. Annually, the nonprofit receives much of its donated food from local grocers and restaurants, along with produce marts and farmer's markets, with last year's intake including 5 million pounds of fruits and vegetables. "Food Finders is providing these families with boxes that contain a variety of nutritious food items that can be prepared as well-rounded meals along with healthy snacks," shared Patti Larson, Executive Director of Food Finders. "Summer puts many of the children whose families rely on school meal programs at a higher risk for hunger — family food budgets are stretched even further than normal." said Diana Lara, VP of Operations. 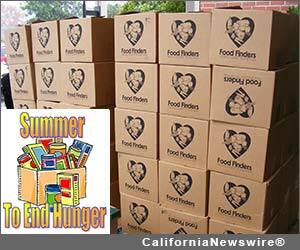 The Summer To End Hunger food drive runs through end of August, 2013. Anyone interested in donating, whether through a local collection site or directly, please contact Diana Lara at 562-283-1400 x101 for more information. A complete list of needed items can be found at http://www.foodfinders.org/ on the homepage under Summer To End Hunger food drive. Food Finders is a 501(c)3 nonprofit multi-regional food bank and food rescue program headquartered in Signal Hill that serves L.A. and Orange counties. They pick up donated food from hundreds of local grocery stores, bakeries, restaurants and produce markets and distribute it directly to missions, shelters and social service agencies to feed the needy and impoverished. Volunteers and staff drivers pick up and deliver on a same-day basis. On average, Food Finders helps provide enough food for 40,000 meals a day, reducing the amount of food insecurity prevalent throughout Southern California.